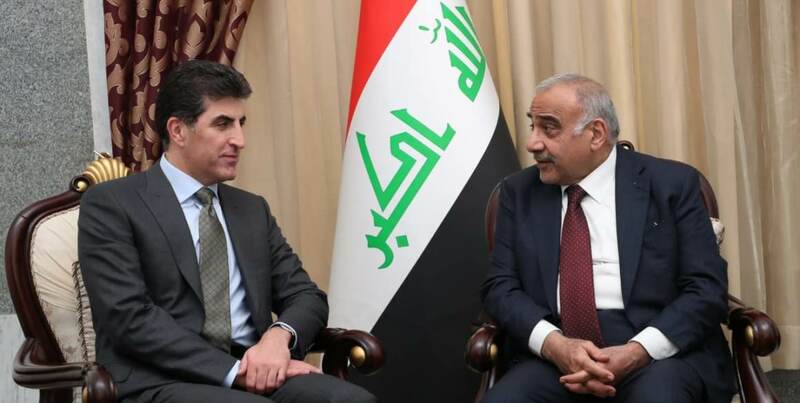 Prime Minister Nechirvan Barzani met the Iraqi Prime Minister Adil Abdul-Mahdi in Baghdad. The focus of the discussion was the improvement of the relations between the Kurdistan Regional Government and the Federal Government of Iraq. The two Prime Ministers concurred that greater efforts should be exerted in order to resolve outstanding issues within the framework of the 2005 Iraqi Constitution. In this regard Prime Minister Barzani thanked the Iraqi counterpart for his endeavours to create a peaceful dialogue with the Kurdistan Regional Government. The meeting was also attended by Deputy Prime Minister of Iraq for Economic Affairs and Minister of Finance, Fuad Hussein, Iraq’s Deputy Prime Minister for Energy and Minister of Oil, Thamir Ghadhban, Iraq’s National Security Advisor, Falih al-Fayyadh, and KRG Minister of Interior, Karim Sinjari.